The Sims is supposed to about setting up a perfect fantasy life, right? And, for some players, swimming pools are a key part of that. But they won't be in Sims 4 and that's made some players quite upset. And while we recognise that some of you will be disappointed that pools and toddlers won't be available when The Sims 4 Base Game launches in September, you should know that we're building an incredibly strong foundation that is capable of fulfilling every one of your desires in the years to come. Concave excavations filled with chlorinated water aren't the only thing going missing from the next Sims title. The toddler developmental stage won't be in the game either, which apparently means that Sims will jump from babies to children. Now, The Sims 4 will have several new features that look promising, like the ability to fine-tune emotions and a build feature that seems more robust than ever before. But taking away already extant features in a long-running franchise is a sure way to annoy diehard fans and that seems to be the case here. how are they removing features from the sims, how is that possible. Swimming pools, the toddler life phase. WhAT NEXT??? REMOVE DOOR? 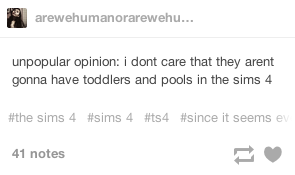 https://t.co/rBbko9fEDL Bring back toddlers & pools in #TheSims4 basegame! Sign this petition? As has been mentioned, pools and a toddler life stage are certainly elements that can be added in as future updates to The Sims 4. 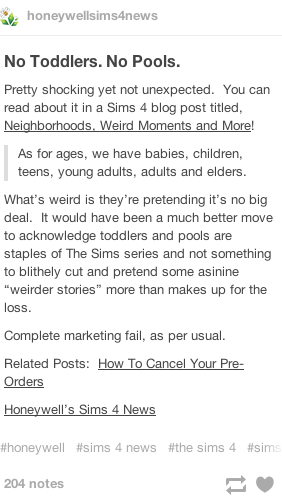 But, for those angry Sims fans, these are crucial facets that they don't want to wait for.